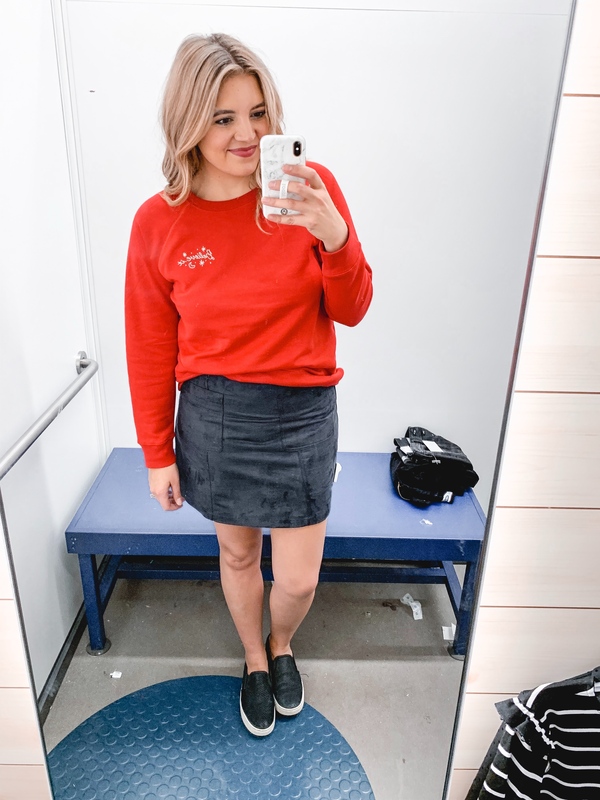 Old Navy is a fan favorite of yours and mine! Any time I ask for suggestions of where you’d like me to go do a try-on, it always comes up! 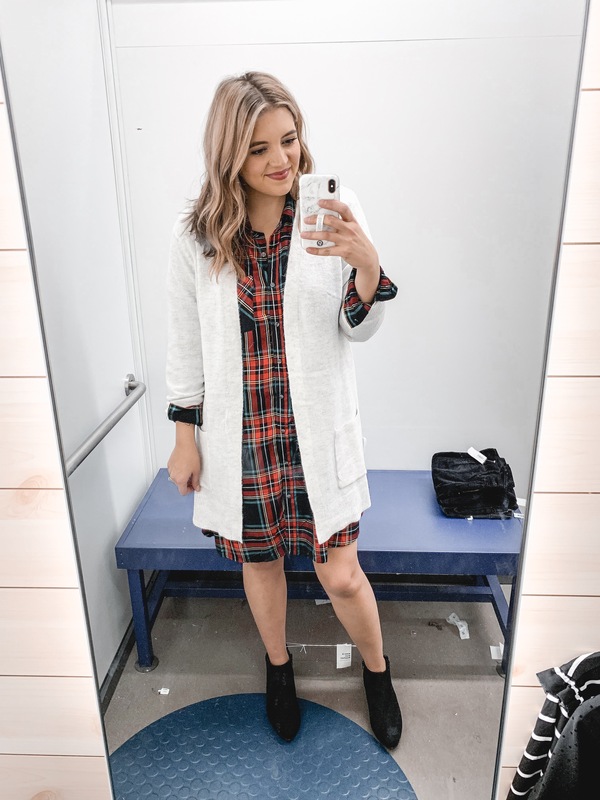 And with the holidays right around the corner, I though it’d be a great opportunity to put together a few Old Navy holiday outfits for y’all! I know not everyone goes to big parties, so many of the looks I created are casual and perfect for everyday. 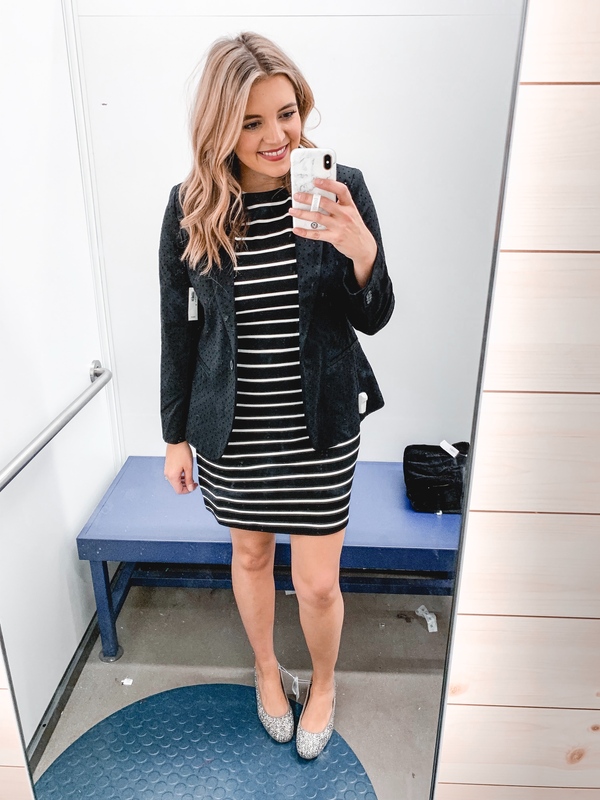 I also put together a few work-appropriate looks for those of you who work in an office setting! And of course I created a few party looks too! As far as sizing goes, I am 5’7.5″ and am short-waisted with longer legs. I currently wear a size 29/8 or medium. I will list exactly what size I’m wearing under each photo! Cute, embellished sweatshirts are such a cute option to keep things casual but also comfy! 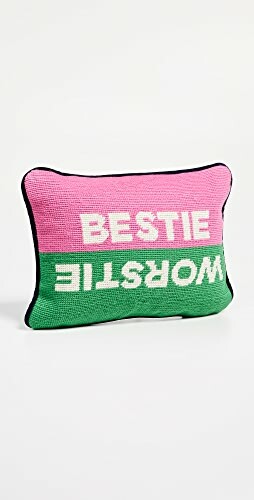 (This one says “Believe it”) They also can be layered up just like a sweater! 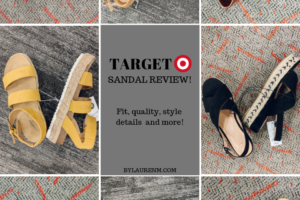 (Scroll down to see a layered look below!) This sweatshirt is a bit oversized, so I would recommend sizing down one. If you want a shrunken cropped look, you could even size down two. I also grabbed these button-front cropped jeans. They were a little too cropped for me. 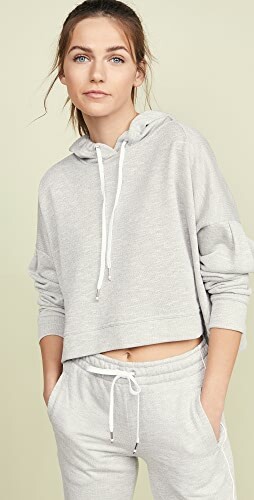 (I’m 5’7.5″) I do think they are a really cute option and remind me of a similar style to a Madewell pair. Sizing-wise, they are extremely stretchy and run large. I tried the 6, but I could have even gone down to the 4. Size down at least one! 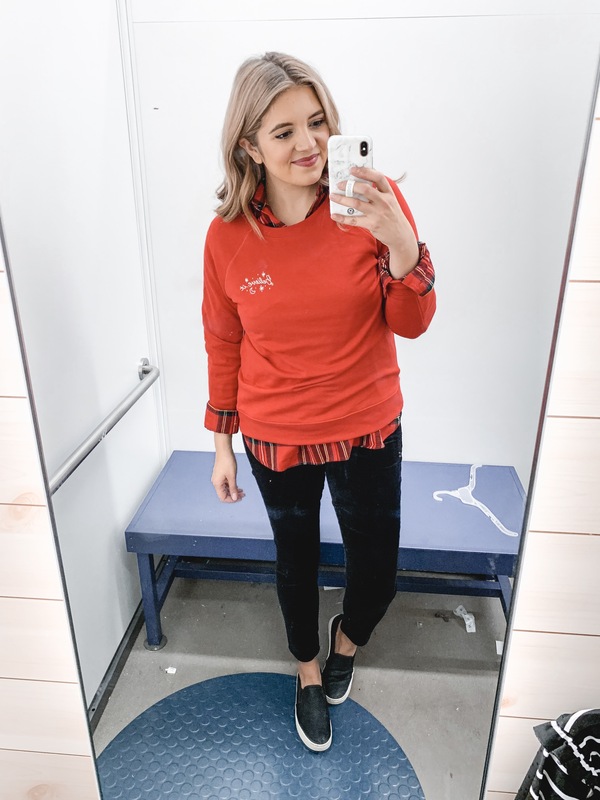 Just to show you how I would layer a sweatshirt like a sweater, I added this red plaid underneath! I sized up one in the plaid to a large for a more relaxed fit. 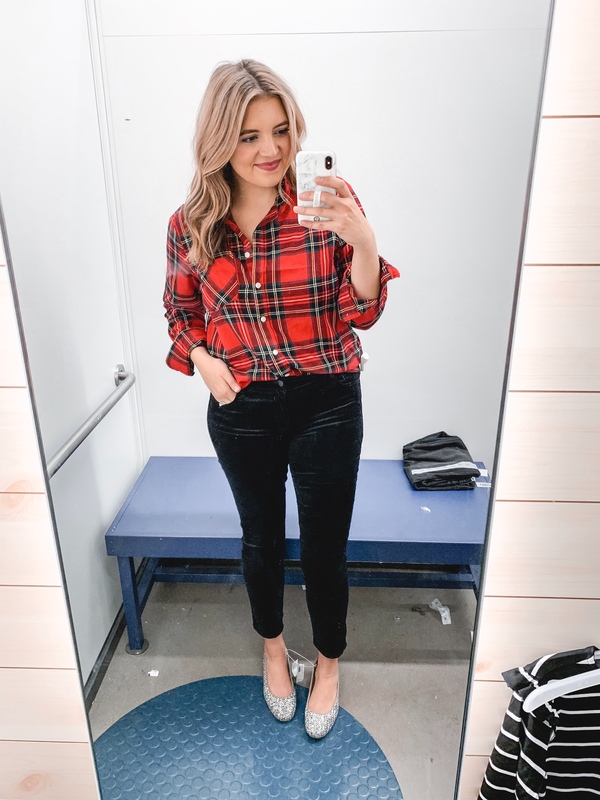 I also tried on these velvet jeans, and looove them! They are a midrise and come in five colors. They are stretchy and so soft. 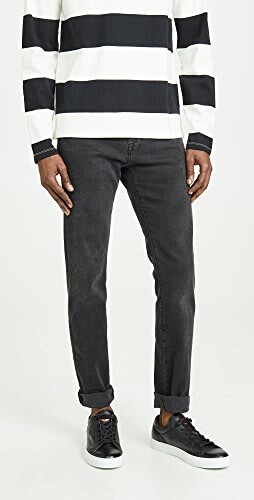 They felt like they might be the kind of pant to stretch, so I’d recommend sizing down one. 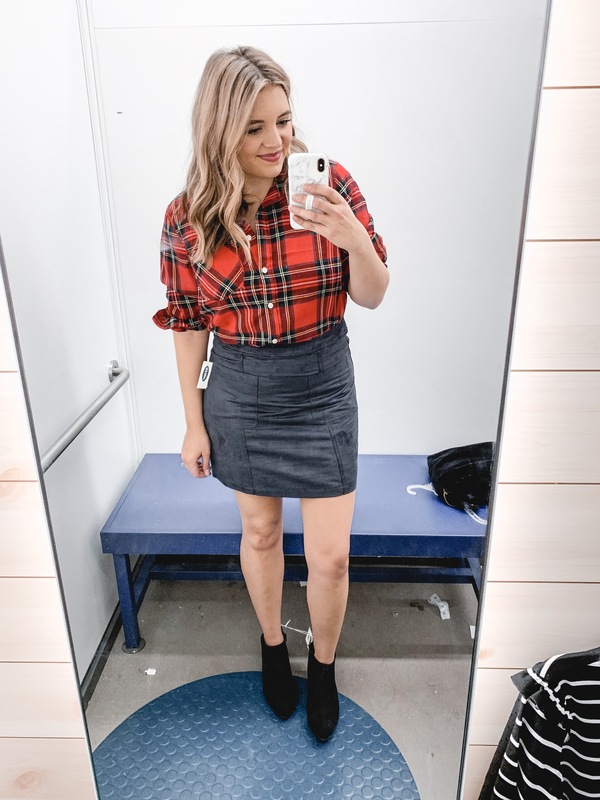 For a slightly dressier outfit, I paired my plaid top with a suede skirt and booties! 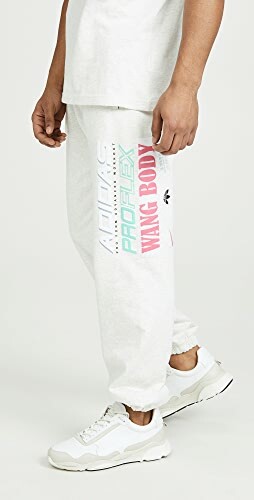 (You could also wear sneakers to make it more casual too!) For cold weather, add tights to this look! Sizing-wise, this skirt runs very small! I tried a 10 and couldn’t zip it all the way up. I would need a 12! Size up two sizes! 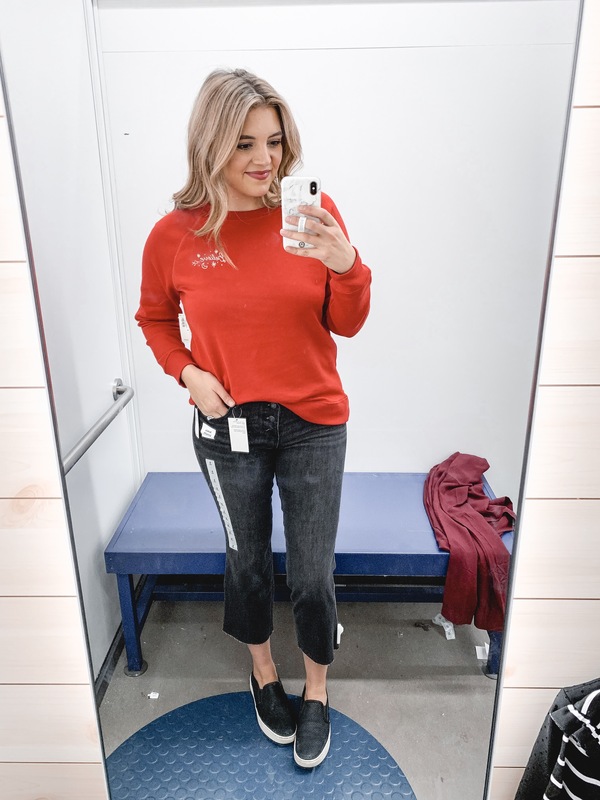 You might recognize this turtleneck from my last Old Navy try-on! 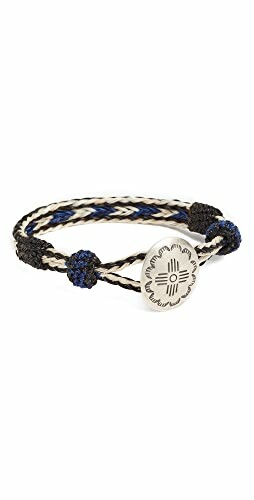 It was one of my favorites, and I actually bought it in the grey! 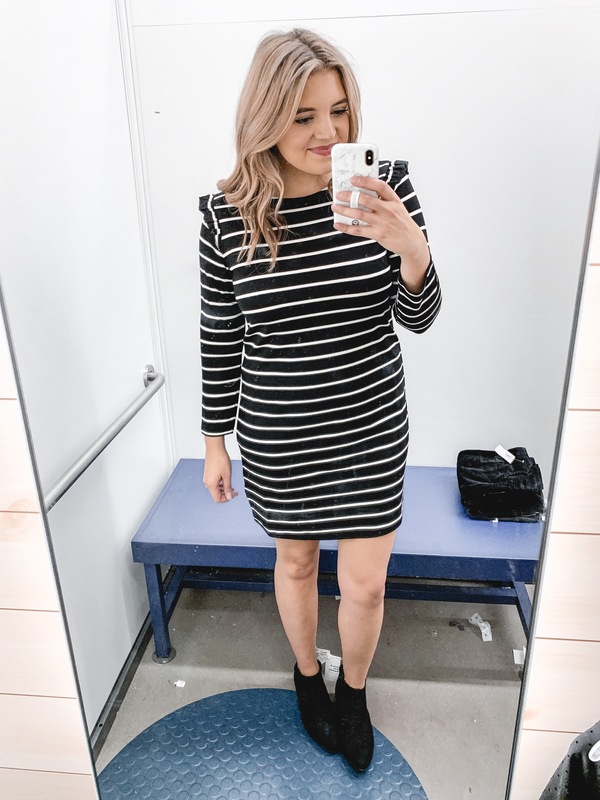 I love the oversized fit of the medium, but if you want a closer-to-the-body look, size down. Since it’s getting colder, I would also wear this with tights! You could also swap out these booties for knee high boots or over the knee boots. 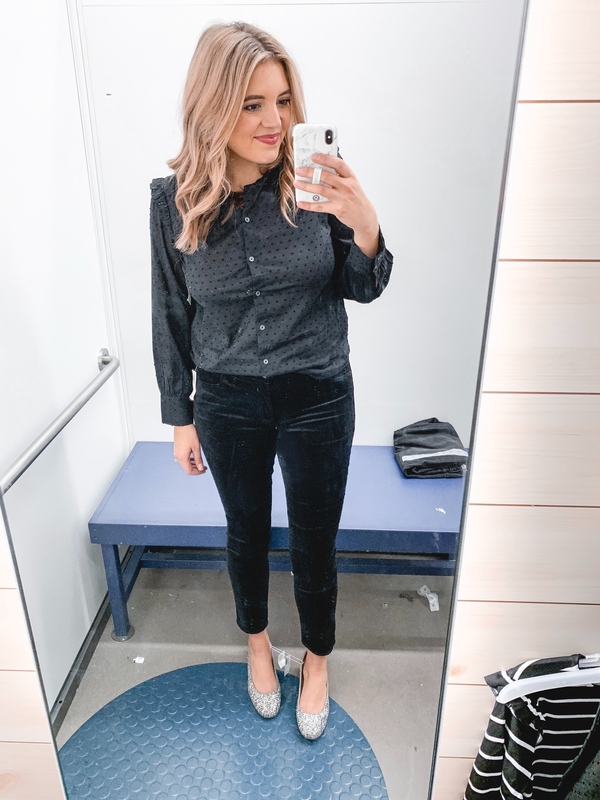 This velvet tee is perfect for everyday and for dressing up! This one came home with me! Sizing is very oversized. I’m in the small and it’s still very relaxed in fit! Sweatshirts aren’t just for jeans or sweatpants! 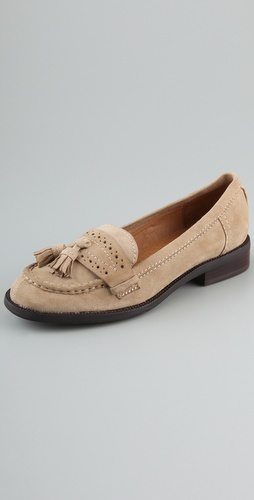 I love this one tucked into a skirt with sneakers. For ladies who work in an office setting, this is a great holiday option! 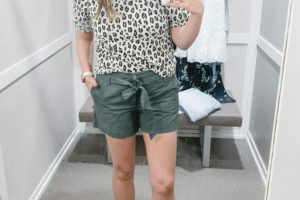 (I’d prefer a longer knee-length skirt to be honest, but this is what I had in the dressing room! 😉) You could also add tights! This blazer is so gorgeous in person and a great quality. It has small velvet polka dots and would be a beautiful addition for all winter long! I also tried this black popover tunic. It’s a blouse-y material, but I actually find it to be that long. I’d recommend sizing up one if you want to wear it with leggings. 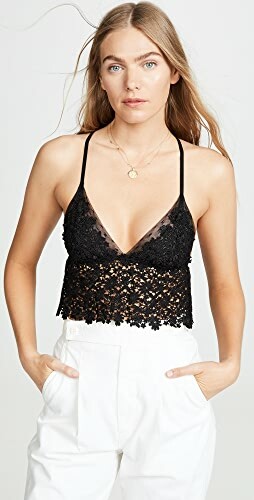 Y’all this top is adorable! 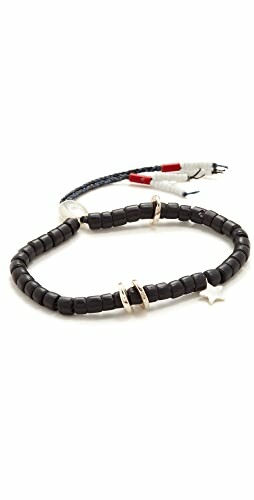 It was another favorite of mine! The details are just so sweet. It has ruffles at the shoulder and embroidered polka dots. The material is a light cotton and fit is true to size. If you have a larger bust, I’d recommend sizing up one. I had just the slightest amount of pulling at the bust line. Another work-approppriate look for you! 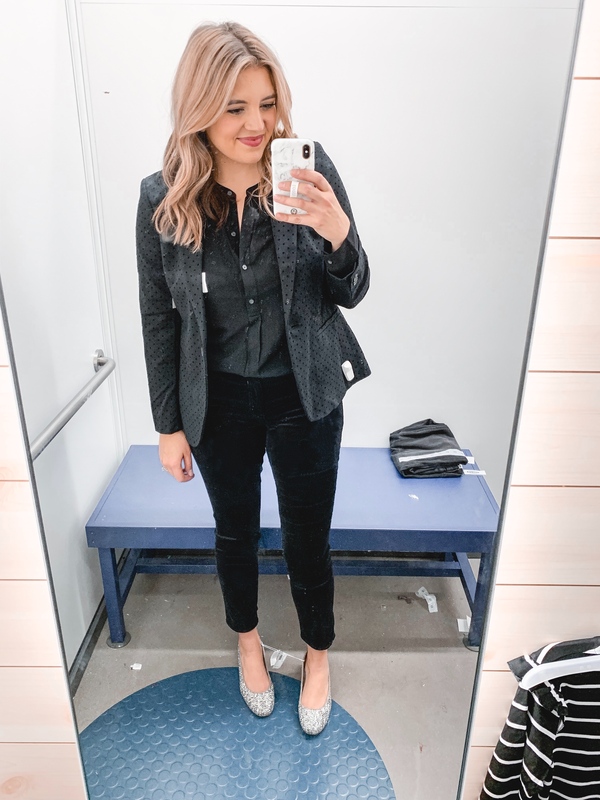 The blazer looked so cute against these velvet pants. This combo is one I would wear every day during the holidays! It’d be so cute for holiday family photos or even Christmas day! 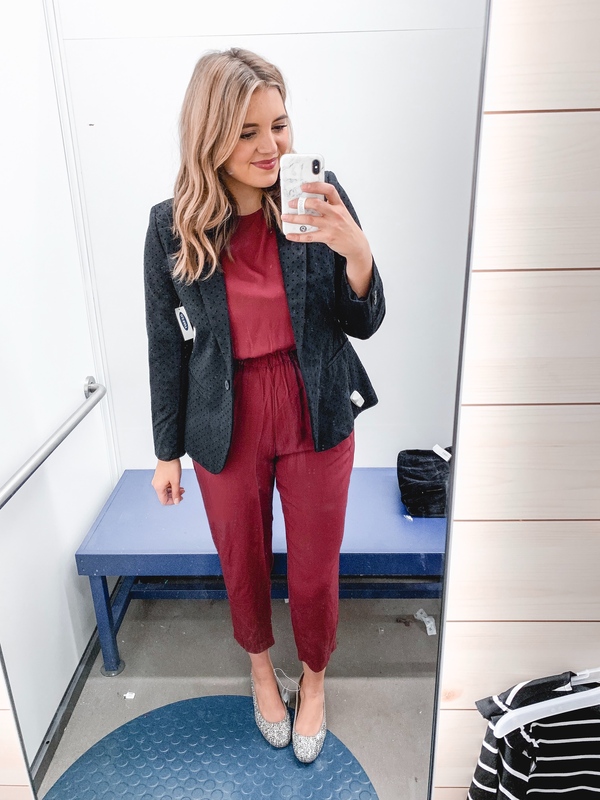 I really didn’t love the way this jumpsuit looked online, but when I tried it, I thought it was adorable! It has an elastic waist and elastic sleeves. The back also has a criss-cross detail with a button at the neckline. This one also comes in a floral print that looks so much like the one I styled four ways from Loft! I’m in a medium. Fit is TTS. For a holiday party, I’d also add a pair of fun sparkly earrings to this look! I love how the blazer pairs with the jumpsuit too! 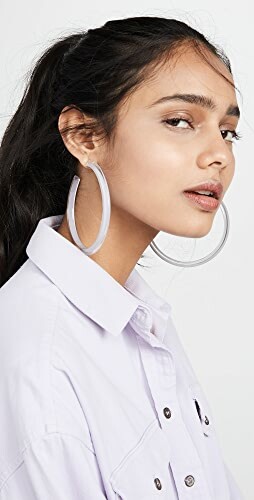 It makes this look work-friendly or something you could wear out to a dressier event. 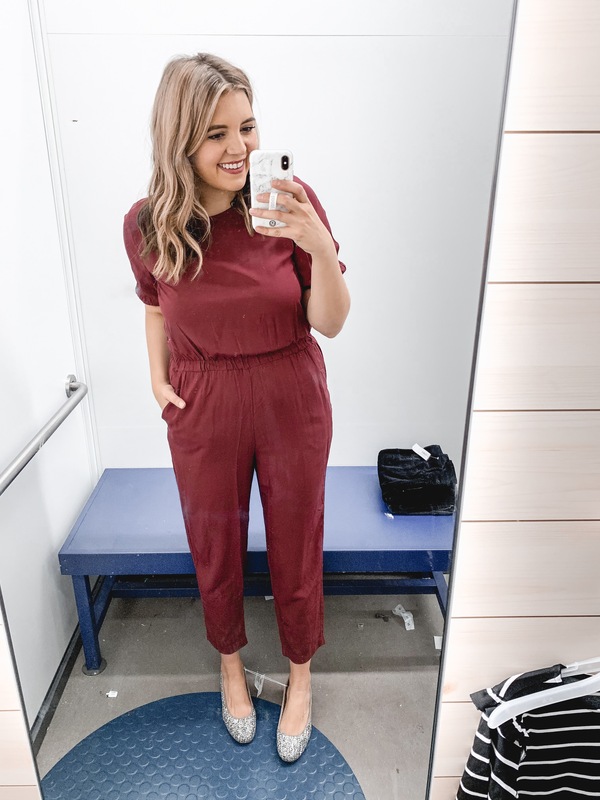 For everyday, I’d wear this jumpsuit with a cardigan and booties or sneakers! Y’all know I love a good layered look. 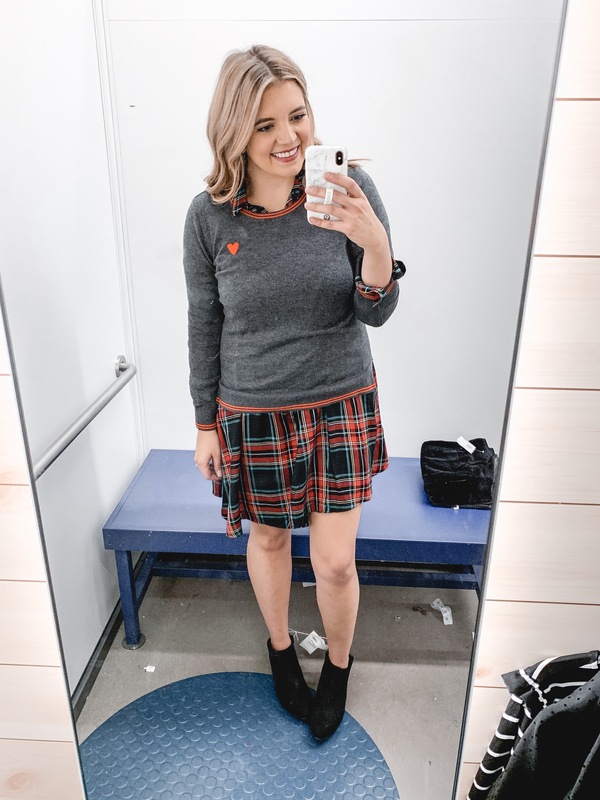 How cute is this heart sweater with the plaid? You could also add tights to this look! To layer it up a bit more, you could also add a long cardigan! To look dressier, swap booties for flats or a heel. You could also swap them for knee high/over the knee boots. Tights would also be an option here. For a dressier look, I added the blazer and glitter heels. Clearly they were two of my favorite pieces!! 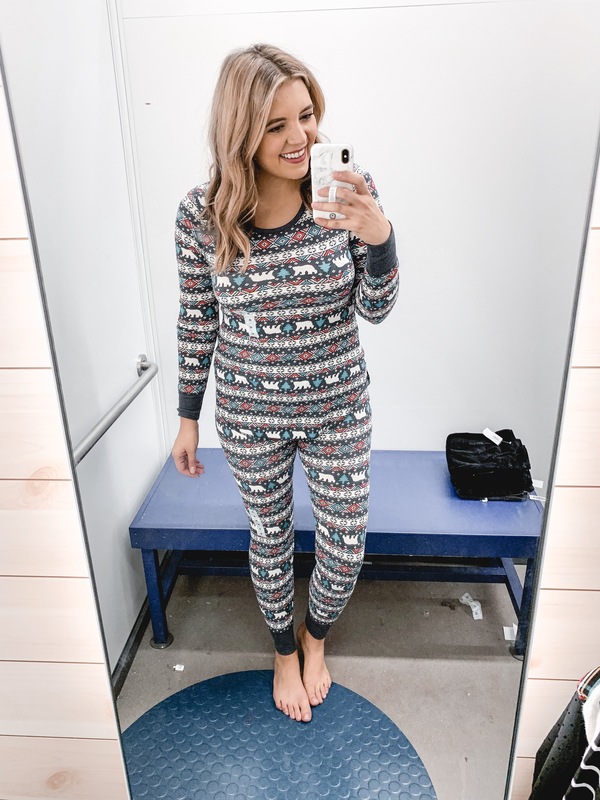 I know some of y’all are still looking for Christmas pj’s so I had to try these! The thermal is very lightweight. 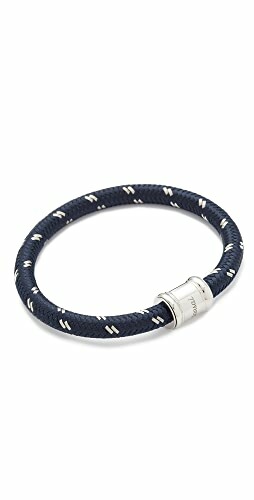 If you want a more relaxed look, size up one. They are a bit more fitted! 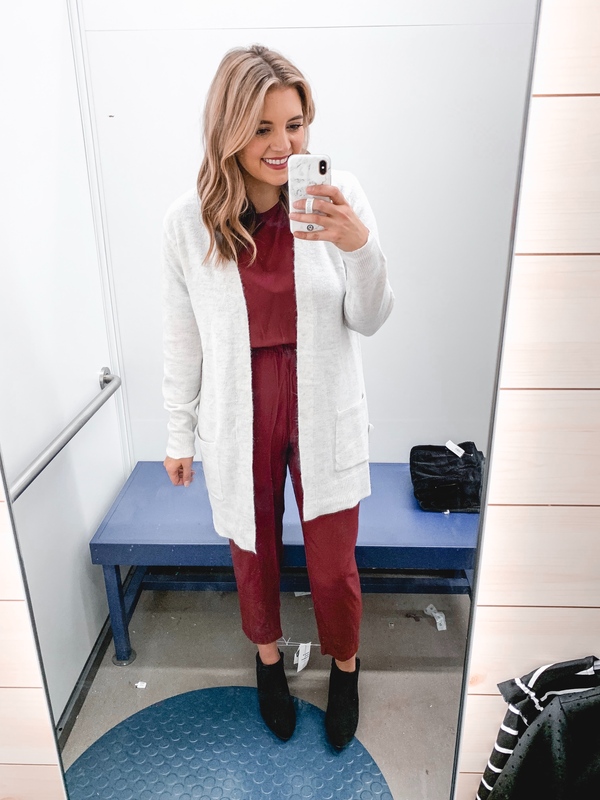 What was your favorite Old Navy holiday outfit? 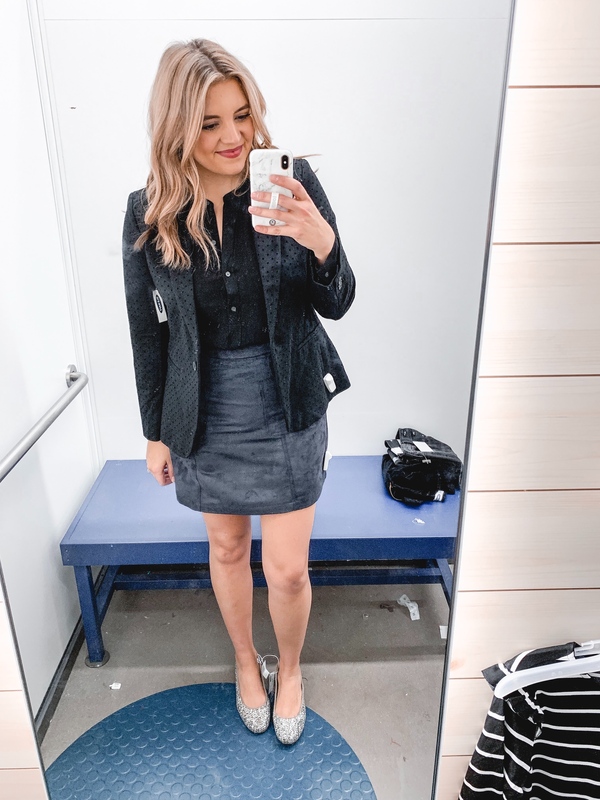 See more dressing room try-on posts here! I love all of these looks! 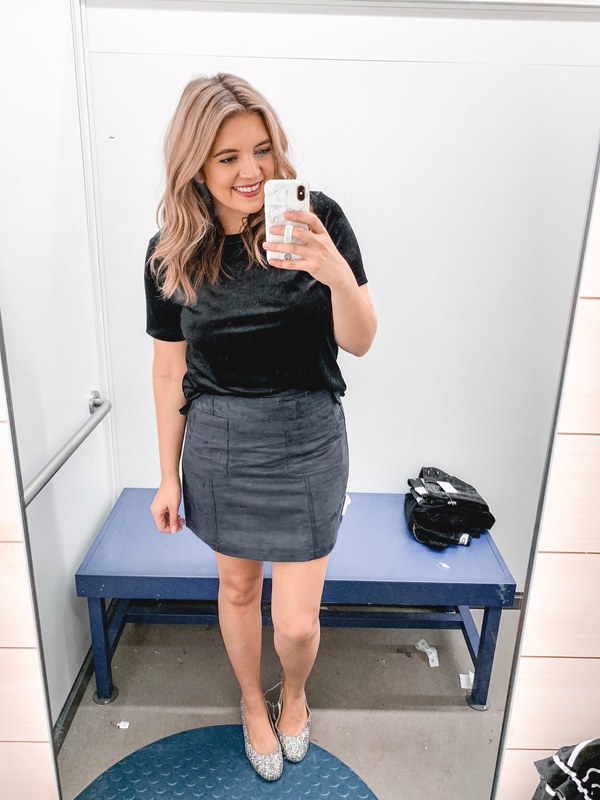 I’m eyeing that suede skirt and I feel like I’m going to HAVE to get it! Love the dotted blazer! 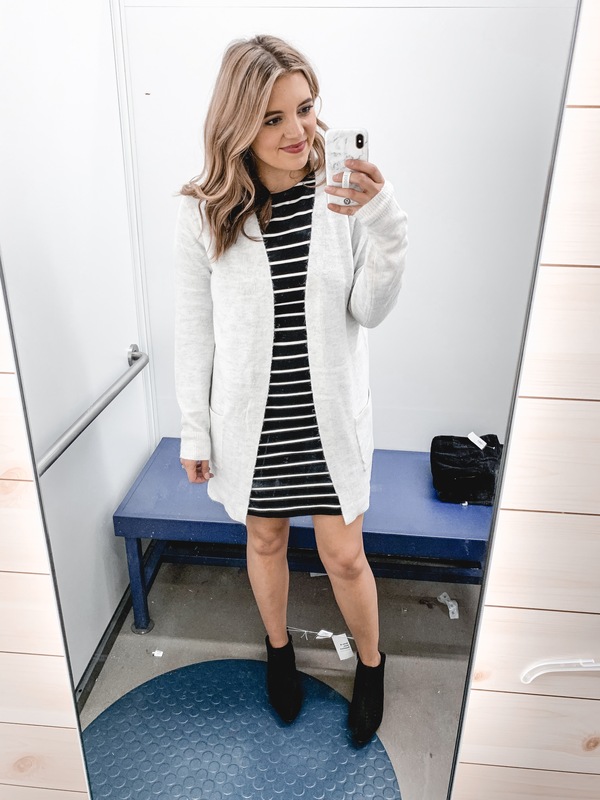 Old Navy is one of my favorites and I have been wanting to shop there recently but just haven’t had time, thank you for allowing me to shop vicariously! 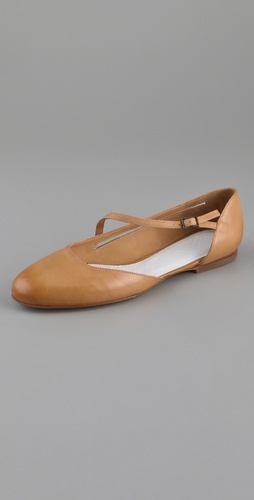 Shop Brown Flat Shoes, Lace Up Dresses, Formal Gowns, Tan Maxi Dresses and more. Get this widget.